crowdfunding Archives - You're Doing Great, Baby! What an amazing month that was! We had never done anything like that before (writing and illustrating a book, publishing 21 blog posts in one month or creating and marketing a crowdfunding campaign) so we had no idea what it would be like. It was fun, emotionally exhausting, hard work and an amazing learning experience. And as Jeff is fond of reminding me IT’S NOT OVER YET! We still have rewards to create, a launch to plan and lots of other things to do. Thank you so much to all the backers, and those who shared the project far and wide. The online copy of the book had over 4,000 page views which is amazing. The money raised by our Kickstarter project is enabling us to get 750 copies of the board book printed, along with producing the other rewards. For those who didn’t pre-order a book and would like to buy one, please sign up for our newsletter (link below) and we’ll let you know when they’re ready to buy. I was meaning to publish a thank you post on the blog earlier this week but I kept on falling asleep with the kids – knackered after pushing through August. And then I saw the pictures of Aylan Kurdi and I felt dumbstruck and deeply sad. Feeling helpless, and somewhat hopeless, about the larger state of the world and at the same time hopeful for my own children makes me think about the big questions. What are we all doing here? How can I best use all the great good luck I’ve been given? What is my purpose in life? I have wondered about this at different junctures in my life. When I was in primary school I wanted to save the world and be Prime Minister. At uni I thought my purpose was to create something of lasting value as an artist. And right now I think it’s to do my best to be kind. Kind to myself and others and the world. Years ago I would have thought that credo was lightweight or unambitious but the older I get the more it feels revolutionary. It’s one of those things that is elegantly simple, but if you look closely it’s actually really complex. So we are getting doing our tax returns, writing mega lists of all the things left to do, taking the boys to swimming lessons, cooking, tidying, wiping up bits of boiled egg from the floor, donating money to refugee charities, going to work and coming home, writing blog posts… the stuff of a life we are very grateful for. We’ve got some exciting news! We’ve finished writing and illustrating the book and are now looking to get the book made as a board book. We’ve set up a Kickstarter page to help us raise money to get board books printed. Between now and 31st August, you’ll be able to visit the page to read more about the project, pledge your support, and get a reward (such as copies of the book!). 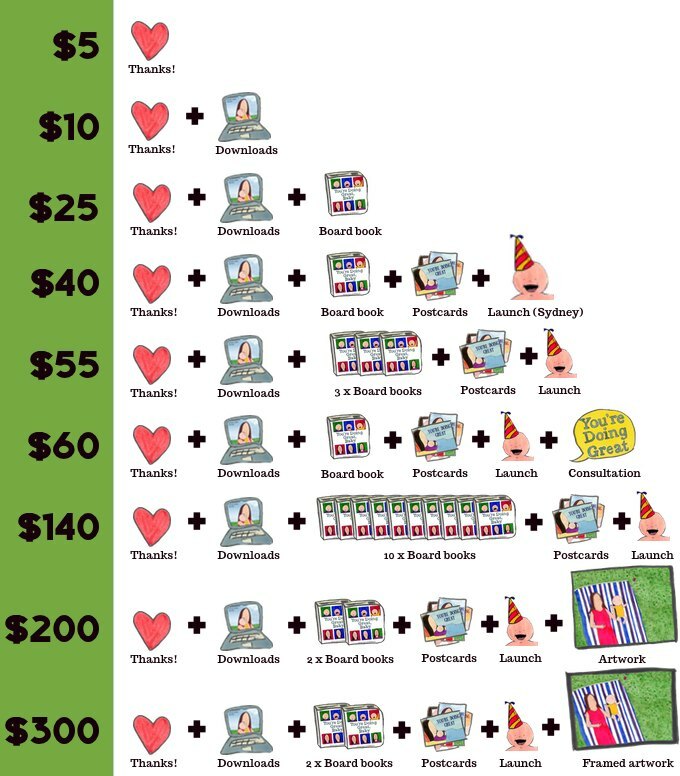 If we don’t reach $5000 in pledges by 31st August, none of the pledges will be processed and we won’t be able to order the board books. So please support us! We’re also very excited to share a special preview page with you! You can read the whole book right now (unless you have babies or small kids with you, in which case you will be interrupted). Thanks so much for being part of this with us. All reward values are in Australian dollars and include postage within Australia.